This has been lingering for quite some time, while government motors tried to benefit — So where does Toyota go to get their lost sales back? … the results are still revealing. Of 58 data recorders analyzed by teams from both the NHTSA and Toyota, 35 showed that when the crash occurred, the brake pedal was not depressed at all. Another 14 showed only partial braking, and 9 more indicated braking only just before the accident. The report said brakes were pressed and released, or both brake and accelerator were pressed together, in a handful of crashes. Drivers may not actually know what pedal they’re pressing during an emergency, explains Richard Schmidt, a psychology professor at the University of California, Los Angeles. In an article in The New York Times, Schmidt noted that “sudden acceleration is very often caused by drivers who press the gas pedal when they intend to press the brake”. PHOENIX – All lanes of a popular roadway out of the Valley have reopened after a deadly crash Friday. According to the Department of Public Safety, both directions of U.S. 93 were blocked due to a 3-vehicle crash that occurred just before noon Friday. DPS spokesman Robert Bailey said one person died at the scene. Bailey said the accident happened at milepost 193 when a Toyota Camry, driven by 80-year-old Arthur Bridgeforth of Wickenburg, veered left of the center line striking a Smart Car traveling northbound head-on. The driver of the Smart Car, 32-year-old Zane Horton of Glendale, died at the scene, Bailey said. A passenger in the vehicle, Jacqueline Horton, 34, suffered serious injuries and was air-lifted to a Valley hospital. Bailey said she is expected to be treated and released. Don’t you think people would know to use golf carts only for their intended purpose on, well, you know, golf courses? They make lousy coffins. 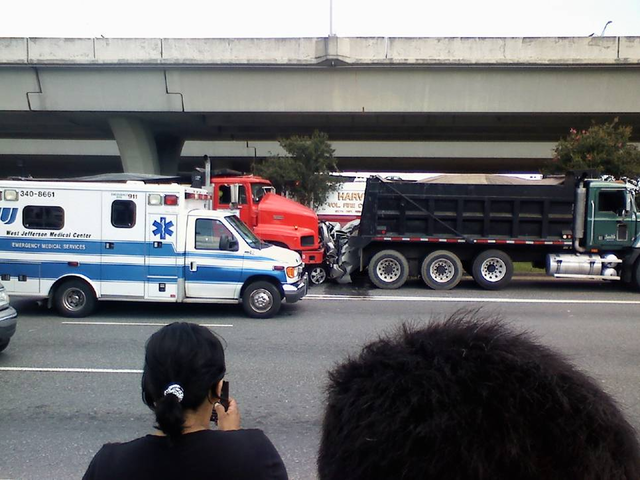 It’s the car stuck between the two trucks… Are they going to put the whole thing in the ambulance and let the hospital sort it out? Locally for more fun and smaller pickups, they even come in speeds that can exceed 70 MPH. Of joy, I bet the crash in one of those from 70 MPH would be thrilling. WSJ Reports: General Motors Co. on Wednesday posted a $4.3 billion loss for the second half of 2009, in the first official accounting of the auto maker’s balance sheet since the company emerged from bankruptcy protection. The postbankruptcy-court GM reported $57.5 billion in revenue for July 10 through Dec. 31. That compared with $46.8 billion for the first half of the year for so-called old GM. But then there is this — WTF? This is sheer madness. How can this be invisible to the nation? The pension plans at General Motors and Chrysler are underfunded by a total of $17 billion and could fail if the automakers do not return to profitability, according to a government report released Tuesday. Both companies need to make large payments into the plans within the next five years — $12.3 billion by G.M. and $2.6 billion by Chrysler — to reach minimum funding levels, according to the report, prepared by the Government Accountability Office. Whether the companies will be able to make the payments is uncertain, the report concluded, though Treasury officials expect the automakers will become profitable enough to do so. If either company’s plan must be terminated, the government would become liable for paying benefits to hundreds of thousands of retirees. The effect on the government’s pension insurer, the Pension Benefit Guaranty Corporation, would be “unprecedented,” the report said. The agency manages plans with assets totaling $68.7 billion, less than the $84.5 billion in G.M.’s plan alone. The report issued Tuesday said Treasury officials were confident that G.M. and Chrysler would earn enough to allow the government to gradually sell its stakes. But the report warned that the government could push the companies out of business, consequently terminating their pension plans, if their recovery efforts failed. “In the event that the companies do not return to profitability in a reasonable time frame, Treasury officials said that they will consider all commercial options for disposing of Treasury’s equity, including forcing the companies into liquidation,” the report said. For those who haven’t caught on yet, is the political expedience to destroy Toyota becoming more clear to you yet? Be a shame if anything happened to it. What is it about the automotive industry that inspires such thuggish attitudes in the Obama administration? The Examiner’s Michael Barone coined the term “gangster government” to describe threats by the White House last spring against Chrysler creditors who had the temerity to insist that bankruptcy laws be followed in the bailout of the perennially ailing third member of the once-fabled Detroit Big Three. Now along comes Transportation Secretary Ray LaHood muttering darkly that “we’re not finished with Toyota” in the controversy over sticking gas pedals in vehicles made and sold in America by the Japanese automaker.